In the previous post we developed our first device based on digital outputs from Galileo board. Today I am going to show emulation of analog outputs. But before we will start to create something I want to return to question about electric schemas. Frankly speaking I am not sure if I want to learn all symbols related to schemas but at the same time we need a tool which will help us show design of our schemas. 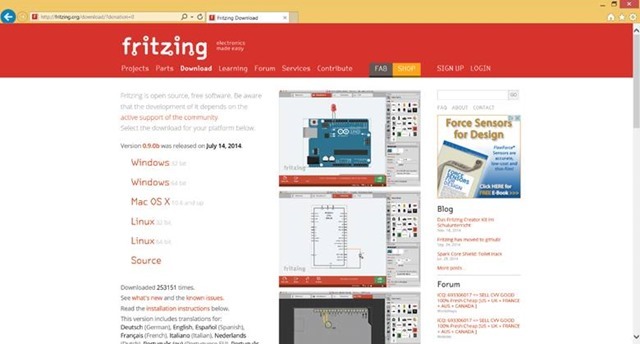 In order to do it I am going to use a free, open-source application called Fritzing. This application was developed by University of Applied Sciences in Potsdam, Germany. You can download the tool here: http://fritzing.org and it contains links to versions for operation systems like Windows, Linux and OS X.
It’s too easy to recognize needed components, put them to a breadboard and understand if your circuit is completed. 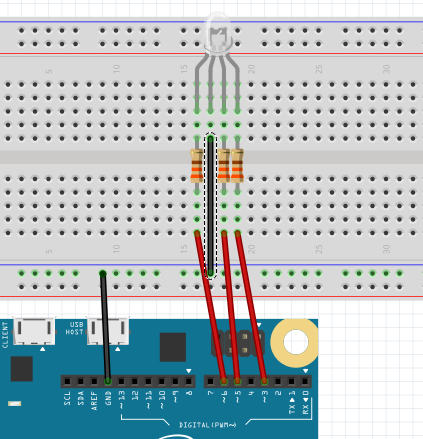 Just drag and drop needed components from the parts section to breadboard and connect them in order to make a route. If you are not able to find some components here you can make search in Internet. 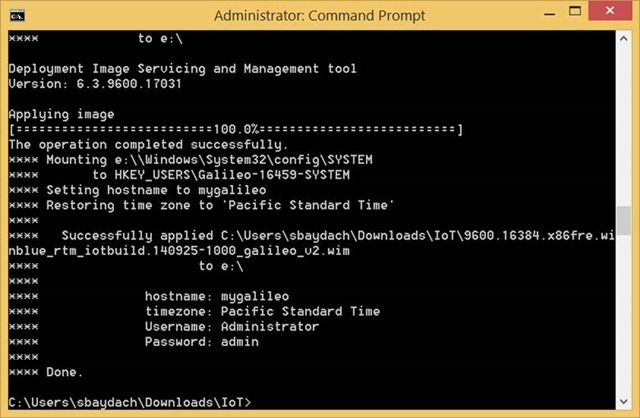 For example, I found a better look of Galileo board on Intel Community site. I just clicked the Mine tab and imported “.fzpz” file there. 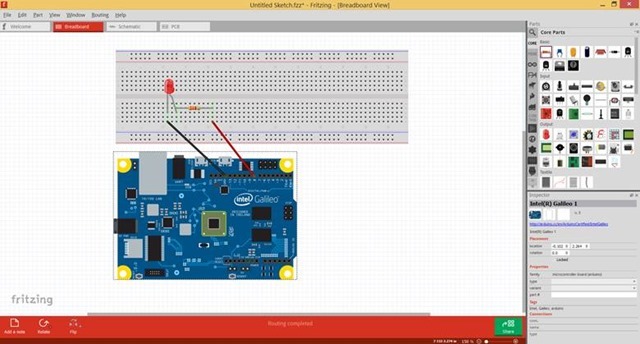 So, I just used Fritzing in order to show our next example. Here we are going to use RGB LED in order to show digital outputs in pulse mode. RGB LED is able to show different colors based on RGB schema (R – red, G – green, B – Blue) and it allows different voltage for each lead (the longest lead relates to the ground; the shortest lead, near the ground, relates to red; the shortest lead, on opposite side, relates to blue color; last one relates to green). As I mentioned in the previous post, we are able to emulate analog output using the digital pins with mark “~”. So, let’s connect each lead of RGB LED to appropriate pins (like the image shows) and complete the circuit. We will need more 330 Ohm resistors in order to resist our voltage. In order to emulate analog output we should use analogWrite method instead of digitalWrite. This method allows to vary parameter from 0 to 255 instead of High/Low and looks very simple in our example. 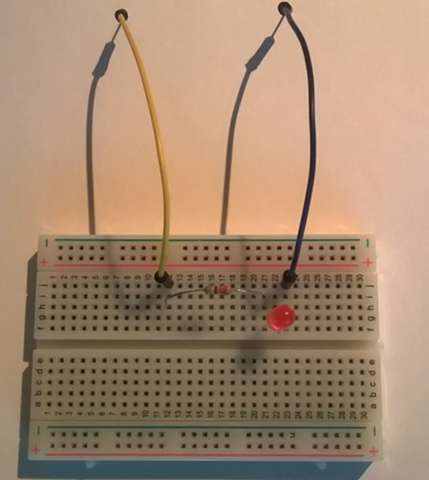 This code will help to show basic color with RGB LED. It will help you to test your circuit and later you can change the parameters of color method in order to generate different colors. In the next article I am going to talk about digital and analog inputs and we will create more examples there. It’s time to start developing a real application, which will have a user-friendly interface, implement several types of notifications and be ready for the Store. I don’t have experience in Android and iOS development, so I will try to develop just Windows Phone and Windows 8 applications and I will publish them to the Microsoft Store. In the previous posts, we developed a Windows Phone (Silverlight) application without a specific interface and we used Microsoft Push Notification Service (MPNS) in anonymous mode, which is good for testing only. 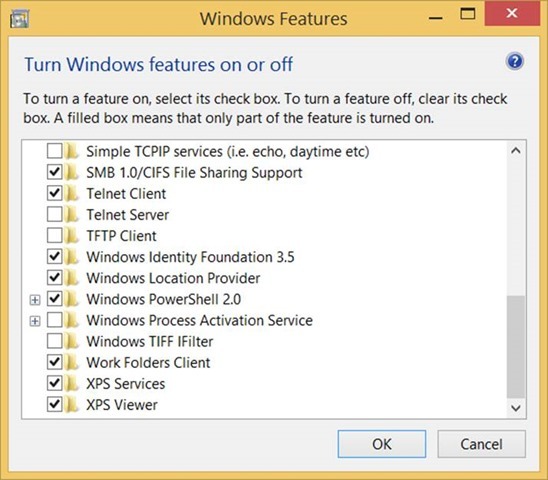 Today we are going to use Windows Notification Service (WNS), which is supported by Windows Runtime. Windows Runtime was introduced almost three years ago as a platform for Windows Store applications with Modern User Interface (Modern UI). It was presented as a new, native, object-oriented API for Windows 8, which helps to develop touch-enabled applications for ARM, x86 and x64 devices. At that time Windows Phone supported Silverlight only for business applications and developers had to develop different types of applications for Windows 8 and Windows Phone. Therefore, developers were waiting for Windows Runtime implementation for Windows Phone, and it was announced this year for Windows Phone 8.1. So, today, developers can share code between WP and Windows applications and use many of their features in the common way. One of these features is Windows Notification Service, which was shared between two platforms and substituted MPNS in WP. In this post, we will use Universal Apps template to develop both types of applications and we will share as much code as possible. We will use WNS in order to send three types of notifications. 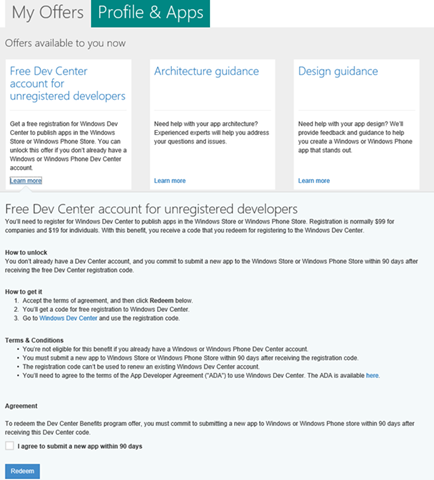 Before we will start coding, we should configure Windows Application Credentials in our Mobile Service (Push tab) but it requires Store registration. So, if you don’t have a Store account yet it’s right time to create it. 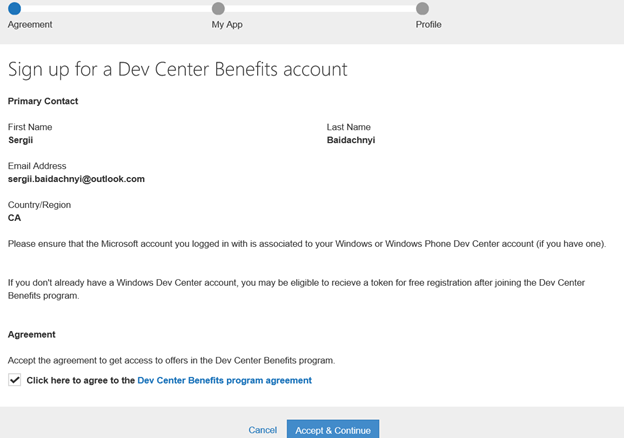 In order to make an account you may visit the following site https://devcenterbenefits.windows.com/ and you will be able to get free access to Dev Center dashboard. If you have an account in the Store, you should go to dashboard and try to submit a new Windows Store application (I know that we haven’t developed it yet). During the submission process, you will reserve application name and provide selling details. But we need the next step, which will help to generate client secret key for our application. Let’s click Live Service site link there. 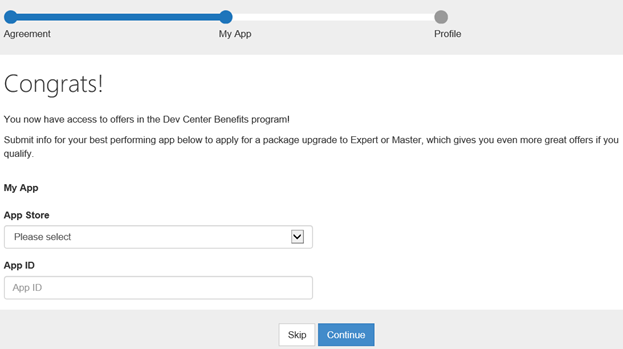 You will be redirected to App Settings page, where you can find a Package SID, Client ID and Client secret. This information is required to send notifications to registered devices. So, copy these keys and put them to identity tab of Media Services. Additionally, I want to make several remarks here. 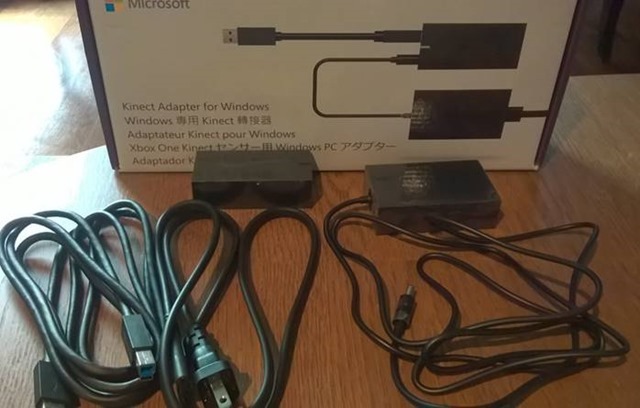 First of all, today we have a chance to associate our Windows Phone and Windows 8 applications. In this case they will use the same notification identities as well as many other features. In order to create the association, you need to visit Windows Phone dashboard and try to submit a new application. 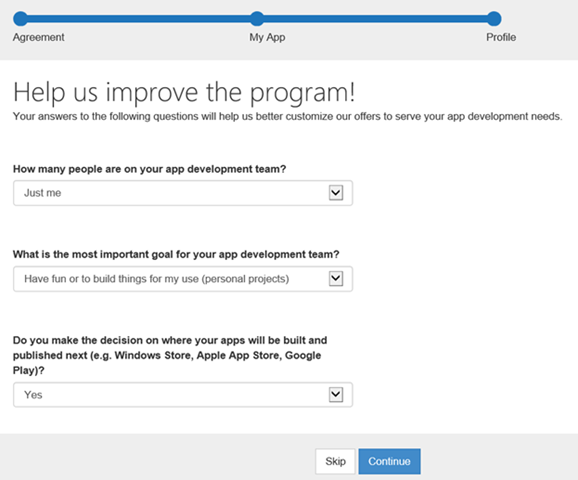 In the first step you will be able to select the name, which you already reserved in Windows Store. You should click “Associate app” button in order to make association between our Windows 8 and Windows Phone applications. 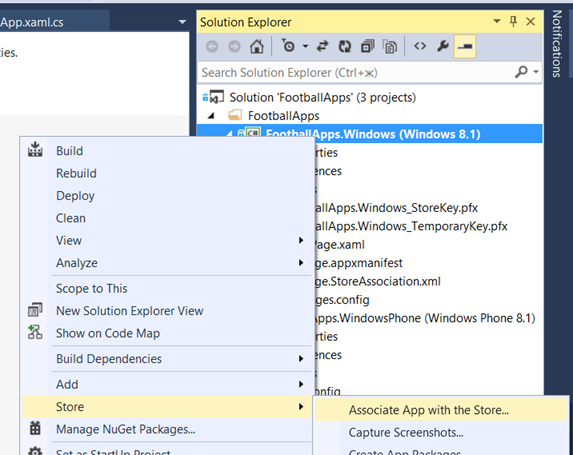 Right after you have reserved names for your applications in Windows Store and Windows Phone Store, you may download all needed information to your Visual Studio project as well. 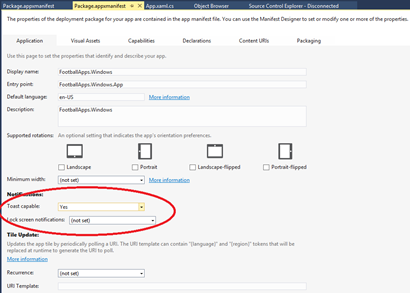 If you forget to do it, you will not be able to test your applications because they will not be able to receive notifications due to wrong package identity. 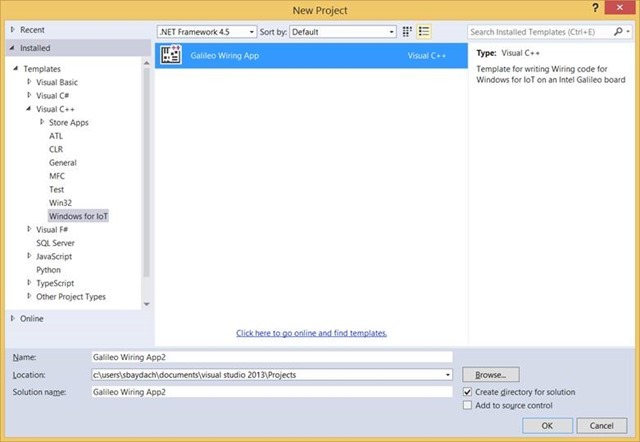 In order to do it you may use the context menu for each of our projects. Below you can find code, which allows to send Toast notifications, Tile notifications we will add later. When we used MPNS, we called just sendToast method but Windows 8.1 as well as Windows Phone 8.1 allow different presentations of Toast and Tile notifications. In this application, I decided to use ToastText02 template, which will show text1 as a title of notification (single line) and text2 as a body of notification (two lines on the screen). You can use any other format for your applications, which can be found here. Right now, we are ready to create our client application. At the first step, we should allow Toast capabilities in our application. We can make it in the manifest file of the application (Package.appmanifest). In order to do it you can use manifest designer (just click the manifest) but you should be very careful because Universal Apps template will not allow to create a single application for both platforms. Instead you will have two projects as well as two applications. That’s why you should make your modifications inside each manifest (inside both projects). Just click the application tab and set Toast capable to Yes. Windows 8 and Windows Phone 8.1 don’t require to create own settings page in order to allow user to switch off/on notifications. Windows 8 will generate off/on option inside Settings charm and Windows Phone supports “notifications+actions” page under Settings menu. 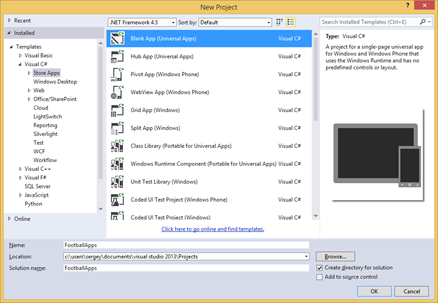 On the next stage, we should add Windows Azure Mobile Services package using NuGet manager. We already did it in the previous posts. In this case, you should do it for both projects. Finally, we are ready to write some code. We will start with code, which will request a notification channel for our device and will send the channel to our Mobile Services. 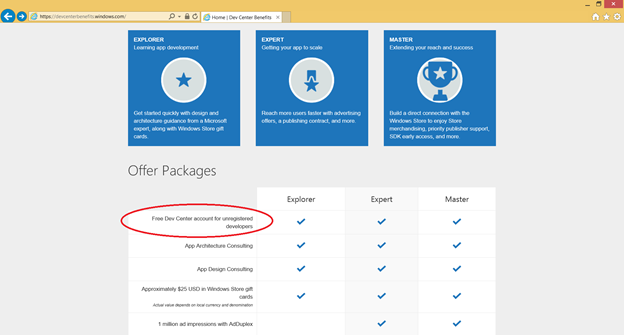 Because you need to do it every time during the application launch, we will use App.xaml.cs file. By default, this file is shared between Windows Phone and Windows applications. We will not change this behavior because WP and Windows 8 application have the same application model and we will have shared code there. In order to create a notification channel we will use PushNotificationChannel and PushNotificationChannelManager classes. MSDN says that we should store our notification channel after each request and compare a new channel to the old one in order to avoid sending duplicate to our server-side. However, I decided to avoid this practice. We will get notification channel for our application on every launch event and we will send it to MobileServices at once. We should understand that there might be problem with Internet, so, we will check possible exceptions related to it and, in case of an exception, we will continue to launch our application without any notifications or something else. This type of behavior is justified because we will upload old data on the next stage. So, we will have a chance to notify a user about problem with network. In any case, we cannot use notification channel as a guaranteed way for delivering our messages. Pay special attention that we don’t use application key on client side. So, you need to modify permission for registration script accordingly. Right now, we can put the method call to the beginning of OnLaunched event handler and it will allow us to receive Toast notifications at once. It’s time to implement business logic of our application but I leave it to the next post. 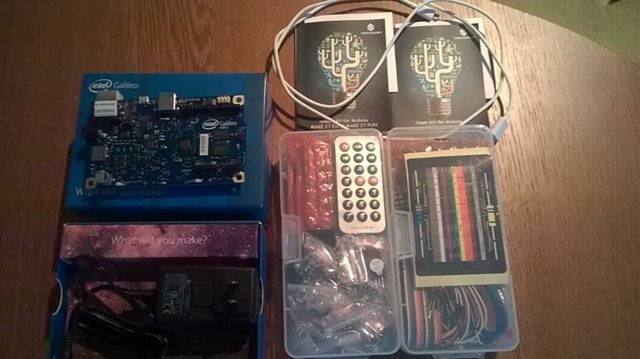 In the previous article we discussed how to setup your first Galileo board and showed some stuff that you need to deploy applications there. In this article we will try to understand what is Galileo and how we may use it in more advanced projects. So, Galileo is a powerful development platform with x86 compatible processor, USB, mini-PCI, Ethernet port, 256MB DDR3, SD slot, which may help makers, students and enthusiasts to develop their own projects. Galileo is compatible with Arduino prototyping boards, so developers may use any existing hardware, which could be used with Arduino Uno or something like this. 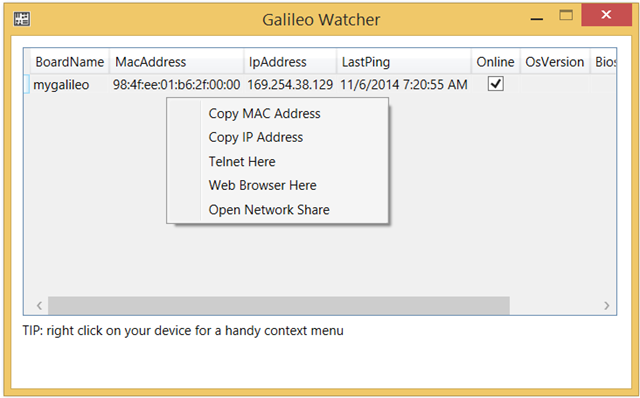 And, of course, Galileo may support not just Linux but Windows platform as well. It allows us to create our software in a friendly environment. Of course, Galileo is the heart of your device and enables reading some inputs from external world and provides own outputs there. For example in order to get inputs you can use many different sensors, buttons, switches etc. and in order to show some outputs you can use motors, LEDs, relays etc. Thanks to the Ethernet adapter, 3G and WiFi shields, Galileo may communicate with external services and other devices, which are connected to Internet. Our goal, in this article, is to understand how we may connect external devices to Galileo and how we may start developing something. From this prospective we will start with the most important part of the board for developers – with pins. Galileo 2 contains two sets of pins, which allow us to control inputs and outputs. In every project we are going to work with pins, that’s why their understanding is so important. Usually we will work with the first set of pins – Digital pins. We may use this set in order to send outputs and receive inputs. You can use these pins for outputs in on/off mode. So, output voltage may have 0V or 5V there. Pay attention that all pins provide 5V voltage but Galileo board has a special switcher, which allows to set board in 3.3V mode in order to guarantee compatibility with some 3.3V shields. We will use just 5V voltage in our devices. If you use this set of pins for inputs, you will have the same range of values there – 0V or 5V. So, we have 13 pins for digital outputs/inputs. But you can notice that some of these pins have a special mark “~”. This shows that we may use marked pins in order to send signals (outputs) in pulse mode. It allows us to emulate rheostat effect, when we have a way to send just n% of current per unit of time. You can use this effect in order to regulate brightness of LEDs or temperature in your apartment etc. The second set of pins (A0-A5) is used for input only. But in this case it should be analogue input like data from thermometers, potentiometers, variable resistors etc. This set of pins is important then we receive data, which describes more than two states. We will use these pins in more advantage projects. Finally you can find some more pins like POWER, 5V, GND and so on. Some of these pins are used in order to control the board, some pins like 5V and VIN are used as source of current and GND pins are used for the ground. So, right now we got some knowledge about pins and it’s time to look at development tools for Galileo. Here there are three functions only. Of course the application will begin with _tmain, which runs RunArduinoSketch functions. The main task of this function is calling setup function and putting loop function inside infinity loop. So, it’s clear that we can use setup function in order to initialize something there and we will use loop function in order to create our runtime logic. We can see that setup and loop functions are already prepopulated. There is just one call from setup function – pinMode method, which informs our board that we will work with pin number 13. This pin is also connected to a led on the board but we can still use it for external stuff. loop method contains just six lines of code but the most important call there is digitalWrite call. This function allows two parameters like number of pin and state. LOW state shows that we should have 0V voltage and HIGH – 5V. In order to understand how it works, you need some information about the breadboard. You can see that our breadboard has several lines that are marked by numbers (from 1 to 30). Pins in each of these lines are connected. So, I used a yellow wire in order to connect pin on my board to pin in line 12 on my breadboard. So, when I put my digital pin to HIGH, current will be in line 12. The resistor connects line 12 and 21, so, we will have 1.7V voltage in line 21. It’s time to connect our LED – put the longer lead (anode) to the same line (21) and put the shorter lead (cathode) to line 23. To the same line (23) connect the blue wire. Finally, you can connect yellow wire to digital pin 13 and blue wire to GND pin and just deploy the default application from Visual Studio. Your led should blink. In order to stop the process you can use telnet and tlist/kill commands there. In the next article we will test more sensors and functions from API.